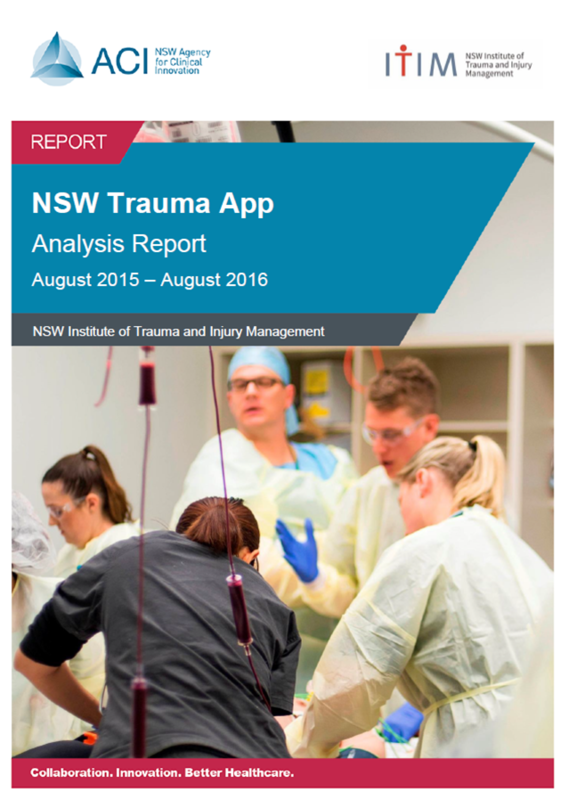 As a result of being awarded a Merit award in the NSW iAwards, the NSW trauma app was entered into the National iAwards. This involved written and live pitches to peer nominees and judges from around Australia. Awards were presented in Melbourne with the NSW Trauma app winning the Public & Government division. “These types of injury are the most devastating, resulting in long hospital stays, permanent disability, and death. With trauma clinicians in more than 450 hospitals, ambulance stations and aeromedical retrieval bases across NSW, resources must be accessible immediately, whether at the scene of an accident, in a rural hospital, or in a major trauma centre” said Dr Dinh. This award recognises the collaborative effort of numerous NSW Health agencies, including statewide trauma and burns services, ambulance, retrieval, and pathology services, and specialist trauma centres across the state. These services include the NSW Agency for Clinical Innovation’s (ACI) Institute of Trauma and Injury Management (ITIM) and Statewide Burn Injury Service (SBIS), NSW Ambulance Health Emergency and Aeromedical Services (HEAS), Greater Sydney Area Helicopter Emergency Medical Service (GSA HEMS), NSW Health Pathology and 20 designated NSW trauma centres. “The Trauma App provides that access. It functions as a portable and versatile resource for all things relating to trauma care that can be accessed at the bed side or first-response site” said Dr Dinh. “The NSW Trauma App includes features such as GPS tracking to provide real time information for all the hospitals in NSW including flight, drive time from patients’ current location, hospital capabilities, as well as specialty burns and paediatrics sections” said Dr Wimalasena. The NSW Trauma app was awarded a Merit award as part of the Australian Information Industry Association (AIIA) NSW iAwards in the Public & Government sector. As part of the award, the app will now also be granted entry into the Australian iAwards in August this year. This enhances operational decision making, reduced time inefficiencies and leads to potential better patient outcomes. Improved the Adult and Paediatric burn calculators, now containing additional data fields, confirmation checks and incorporation of the new guidelines of Australian and New Zealand Burn Association (ANZBA) for burn management. Improved access, user experience, tagging and sorting of localised guidelines. The new version contains additional guidelines and allows offline user access of the app features. Refined several calculators together with improvements to the time stamp/check list functions and much more. Added a favourites section allowing fast access to your favourite guidelines, calculators, facilities etc. Incorporated popup messages to notify users of any available app updates. The video below provides a walk-through of the app, highlighting the many features of the app. This app is developed for all medical, nursing and allied health clinicians of NSW Health and NSW Ambulance working across the trauma continuum within the state. * Results trend compared to findings from the Analysis Report: 21st August - 8th November 2015. The NSW Trauma app is currently being adopted by the international trauma community with users downloading the app from Australia, Canada, Ireland, New Zealand, United Kingdom, and the United States. If you have any questions in regards to this innovation please do not hesitate in contacting Jon Newman (project lead) on (02) 9464 4663 or jonathan.newman@health.nsw.gov.au.